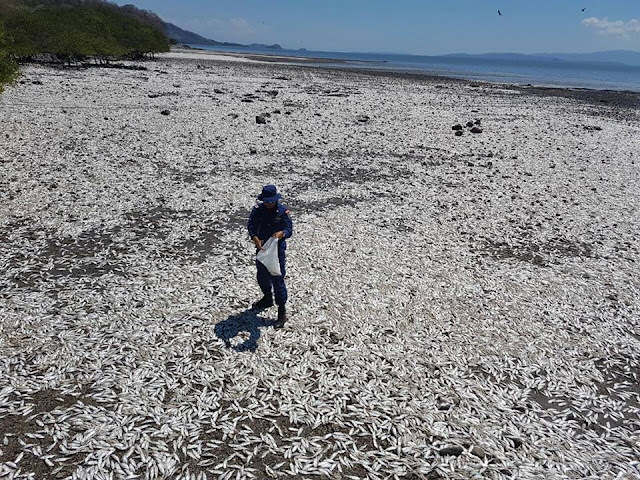 Disturbing images coming from Costa Rica's Gulf of Nicoya showed millions of dead sardines washed ashore near the coastal town of Manzanillo. Preliminary online reports from various agencies including marine conservation group Fundacion MarViva say that the washed-up hordes of fish were seen for a few kilometers. According to a Facebook post from MarViva, it seems only to be a sardine species that suffered the widespread deaths. However, no exact cause for the incident is yet known. The report said it is unlikely that the phenomenon was caused by chemical poisoning or that it has anything to do with warmer water temperatures in the Gulf of Nicoya, since a single species appears to have been affected. "It's possible that this is related to the eating habits of the sardines," the MarViva announcement read. "Since they are herbivores, a mass mortality of this type could have something to do with the consumption of a toxic phytoplankton or algae that may have become more prevalent in the Gulf." Coast Guards and marine biologists arrived quickly on the scene to analyze the strange incident and take samples for researchers at the National University, a press release from the Public Security Ministry noted. The officials scanned the 2.05-kilometer expanse in Manzanillo where the dead fish were seen on land and floating in water just above the Abangaritos River. MarViva's announcement further recommended that people in the region refrain from eating sardines for the time being. Recent appearances of dead fish in other parts of Latin America, such as Chile, have similarly puzzled marine biology experts. Two weeks ago, a 20-meter-long blue whale washed up on the beach in Costa Rica's Santa Rosa National Park in Guanacaste. FUKUSHIMA... The Oaxaca and Guerrero coastlines are radioactive. This is confirmed but being hushed by the scientific community. The food chain is collapsing before out very eyes. Yet, no one dare say FUKUSHIMA.